The key to creating a truly resilient and sustainable stormwater management plan for your home landscape is to understand your site. Look at how water works in your landscape and how it fits into the big picture. Identify existing issues and opportunities for improvement, and respond to your site’s stormwater needs in a way that’s best for your climate. Here’s how to get started. Photo: Cultivart Landscape Design; original photo on Houzz. It’s helpful to look at your landscape as a whole when analyzing how water moves through it. Watch your yard during a heavy rain and take notes on where and how water moves and puddles. How do different surfaces and areas of the garden interact? Seeing your landscape during a rainstorm will help you think about the bigger picture for its stormwater design. In the yard here, water from the roof runs through the downspout to a rock swale that carries it through the garden. 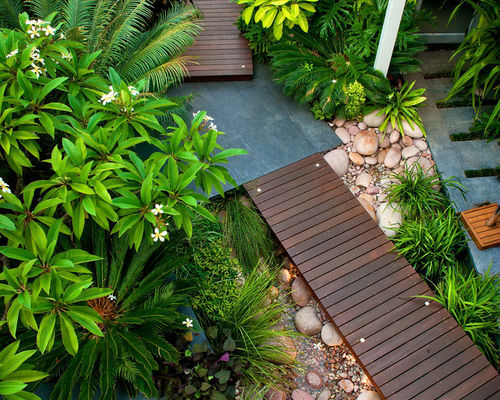 The decking and planted areas harmonize beautifully with the rock swale as it flows through the space. Photo: Root Design Company.com; original photo on Houzz. Know your climate. Know your region’s annual rainfall and when it usually occurs during the year—when is there too much or too little water, and how does that relate to your garden? For example, arid climates frequently have extended periods of drought but can also have heavy rainstorms during concentrated periods of time. Water storage and harvesting are great ways to respond to this condition. Other climates, like the Pacific Northwest, receive regular rain over the course of the year, and residents must create strategies for moving and infiltrating water from rain showers year-round. Understanding your climate’s rain will help you plan your stormwater management strategies. Photo: Lisa Wilcox Deyo Landscape Architecture; original photo on Houzz. Know your soil. Soil has the amazing capacity to cleanse water as the water filters through it. This is one of the primary reasons infiltration techniques are so important. Allowing dirty runoff from a driveway to percolate through the soil can clean the water before returning it to the groundwater. However, your soil needs to be able to effectively absorb stormwater to clean it. If water already can easily infiltrate your soil, you’ll have less work to do, because you can tap into your soil’s inherent properties to manage runoff. If you have poor infiltration due to soil compaction or a high clay content, you’ll have to do more work to manage water effectively. Photo: H&G Landscape Architects; original photo on Houzz. Most homeowners don’t know they have a water problem until their basement floods or a drought kills all of their garden plants. Before this happens, walk through your site and look for clues about how the water is behaving. Here is a list of questions to ask to help you identify challenges and opportunities for improved stormwater management in your landscape. Which surfaces are contributing to runoff? Calculate the square footage of the roof, driveway, patio, walkways and other nonpermeable surfaces. 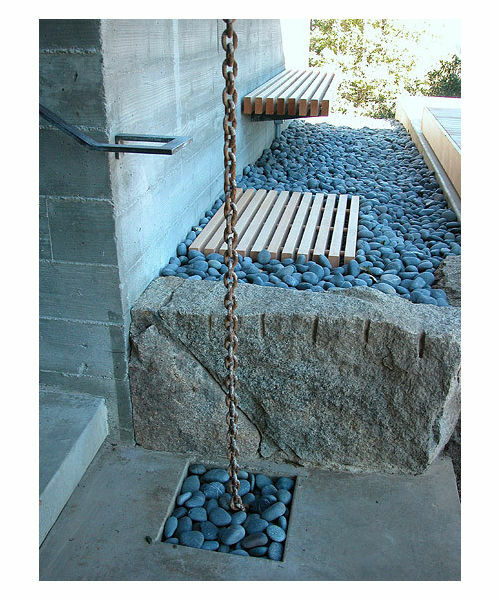 See runoff as an opportunity for integrating water movement into your landscape design. Swales and rain gardens can be beautiful features. Where is water pooling or sitting for prolonged periods of time? It’s normal for water to pool in spots during a heavy rain, but it should drain away within 24 hours or less. Depending on the situation, areas with pooling water are an opportunity for regrading. 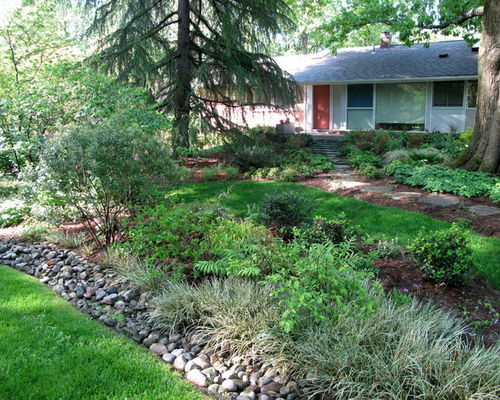 Grading reshapes the ground to manage water and help tie together areas of the garden. Where are soils eroding? Soil erosion is a major concern and will only accelerate over time if it is not stopped. Even minor erosion will get worse with time. Areas with soil erosion are great places to plant ground covers and vines that stabilize soil. Are there drought-prone areas? Check your plants on a warm, sunny afternoon for drooping leaves or sunburned foliage. Does the plant look wilted? Are the leaves being burned from sun exposure? These are signs that your current plants are drying out and will require too much irrigation to survive. The opportunity here is to plant species that need hot, full sun to flower. Depending on your climate, they could be succulents or native perennials. 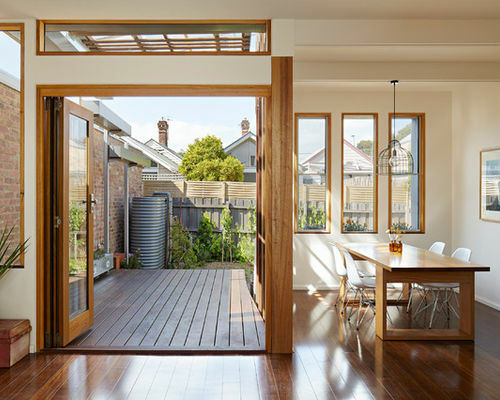 Photo: Christopher Megowan Design; original photo on Houzz. Store, slow, spread and sink runoff. Storing water is a great way to reduce irrigation demand and intercept runoff. 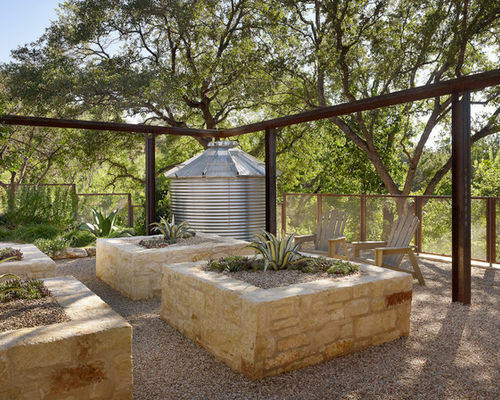 In the space here, a roof downspout directs roof water to a rain barrel for storage. Slowing down and spreading runoff with swales and rain gardens helps to prevent flash flooding downstream. Green roofs and permeable paving are other great methods for intercepting stormwater at the source. Allowing water to infiltrate the soil—also called sinking the water—whenever possible is the best thing you can do for your landscape and the environment. Move and infiltrate pooling water. Water that pools or ponds for more than 24 hours after a storm can be a sign of poor soil infiltration and/or too much runoff with nowhere to go. 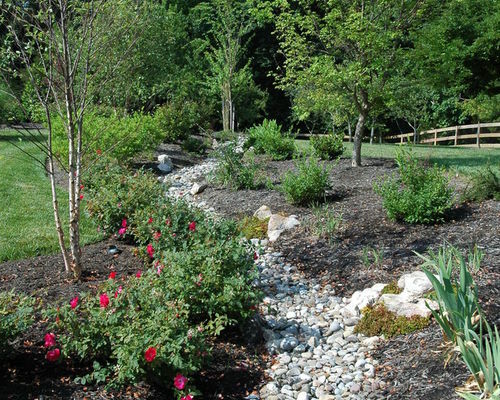 If your soil cannot efficiently absorb the stormwater where it pools, you can move the water to a point in the landscape with a rock swale, runnel or rain chain where the soil can absorb it. If your soil cannot effectively manage water on its own, or if you don’t have space to carve a swale through the landscape, you can also combine subdrainage with swales and stormwater planters to effectively manage water. Photo: Feldman Architecture Inc; original photo on Houzz. Stop soil erosion. You have a soil erosion problem if you find washed-out areas of barren soil or see that soil has been swept away from foundations or tree roots. It means water is coursing through that part of your landscape too quickly, which is evidenced by rivulets and cuts in the soil from fast-moving water. There are many solutions to this issue. Any of the sustainable stormwater techniques mentioned here can reduce the overall quantity and speed of water on the site. Additionally, look at how water meets the ground from your roof downspouts and be sure to slow, spread and sink the runoff at those points. Additionally, be sure to implement erosion control methods on steep slopes and areas with erosion-prone soils. Use drought-tolerant plants for dry areas. There are hot, sunny microclimates in the home landscape that can dry out significantly, even in climates with plenty of rain. Instead of wasting potable water on keeping those plants’ roots moist, use drought-tolerant native plants or other suitable drought-tolerant plants. Plants that thrive in hot sun will handle drought conditions and require far less irrigation than water-hungry alternatives. Plant shade trees as another strategy for cooling down overexposed areas. Trees benefit the home landscape by reducing the overall ambient temperatures in a city. With cities being warmer than nonurban areas—called the urban heat island effect—trees can play an important role in regulating temperatures around the home. Increased shade from trees also helps the garden retain moisture, which means less irrigation in the long run.